I like to keep healthy, I also like to eat out a lot. Sometimes the two things are not a good combination! Seriously I have been thinking of how to improve my health recently, this has involved walking for at least 30 mins a day and eating more fresh fruit and vegetables. As many of you know I avidly enter competitions and one recently caught my eye. It was to win a box of food from a local company Taste Wales. Taste Wales is run by Nicola who both juggles the responsibilities of a young family with running a box scheme company for fruit and veg. Well I was so impressed with the prices - and surprised that they didn't charge for delivery, that I ordered a Small Fruit Box and also some extra peppers. The small fruit box was anything but small, they use seasonal fruit so you always get the best value and I have to say the quality of the fruit was excellent. £10 for a box of fruit that contained nectarines, strawberries, plums, apples, bananas, grapes, tangerines, pears and grapefruit was fantastic value. I decided I wanted to know more about the company so decided to send Nicola some questions, to find out more, here are her answers. Why did you start your company Taste Wales? I had a graduate job at a large global organisation, but long hours and starting a family meant I wanted to change direction as I got older. With the costs involved with childcare and travel for work it seemed like a good idea. 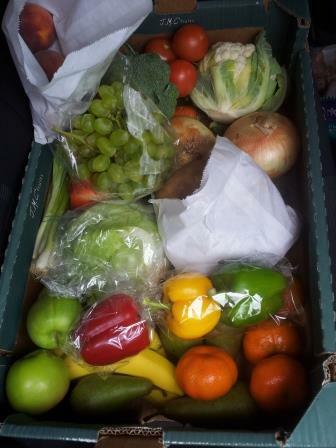 I have wanted to do fruit & veg boxes for a few years and also work with local Welsh produce as I am passionate about healthy living and all things Welsh. There are Organic companies that run box schemes in Wales but none that do great quality, GMO free, Class 1 produce. The supermarket food is often bland and after a little research, realised there was a market for this. 18 months later I have grown from local trade to covering much of South Wales, and not only sell to residential, but also wholesale to commercial clients. To me, the business isn’t just a fruit & veg delivery service, but about working with my customers on ensuring they get a balanced, healthy lifestyle which is then linked into future company ambitions and my Nursing degree. Currently we cover most towns in South Wales. Cities are not targeted yet as they are so big for the resource currently available, but once the shop opens I hope to cover all of South Wales. Where and when will your shop open? We are hoping to open in the Autumn in Woodland Walk Garden Cenre, Efail Isaf, near Pontypridd, South Wales. Best Sellers are traditional items. We as Brits are quite wary of trying new things, so I like to provide traditional seasonal boxes but incorporate a different type of fruit each week plus a freebie. I think with money being tight for many of us, we like to spend it on what we know if fear of waste. This is a good way to get people tasting new foods. This time of year Summer Berries and Cherries are best sellers and Vine Tomatoes. My customers are generally split 50/50. Half like to receive the seasonal boxes, not knowing what they get each week. Others like to do the Pick Your Own option so they know exactly what they are getting. How do you juggle the demand of parenthood and a business? I have No idea! (Lol). My partner works away Mon – Fri, I have daughter 2.5 and son 8 months. I breastfeed too so no one can have my son for me. With deliveries the kids are often with me, so I have now got some additional support from my family. Facebook marketing has been great for me as even if out and about with kids, I still get alerts on phone and can respond quite easily. The fact that I can do this work (usually with baby in harness strapped to me) and with children around me means I get to be with them, whilst they are in young, yet hopefully teach them the value of working to live, rather than living to work. Spare time? What’s that? Haha. Obviously being home alone with kids means walks or play time with children. Weekends are quality family time. Having quality fresh food at hand is great for cooking / baking which we love to do. Once kids are asleep and work caught up on, I enjoy the peace to read. Other time is spent sorting out all admin work for getting my shop opened. We are working on developing a mobile app for the business, and I'm going back too University in October to study nursing whilst keeping the business going and growing. So if you want to support a local business and receive a fab box of local produce, why don't you check out Taste Wales now. If you would like an order list email Nicola info@tastewales.co.uk and if you quote Jewel13 or say The Diary Of A Jewellery Lover sent you, you will get 10% discount off your first box. Looks wonderful! Very appealing - might look in to a delivery myself! I think I'm just about within their delivery area, which is great news, I didn't think there was a veg box scheme that came out to us. I'll have to look into it a bit further. You can always try it, and see what you think. I think you will be coming back for more though! 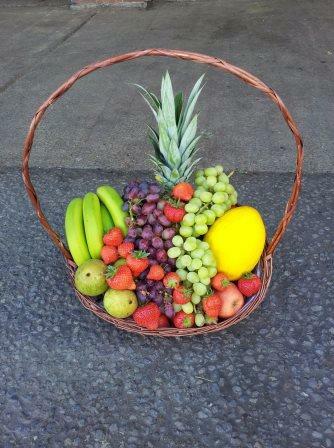 They look very tasty, nice to have fresh veg and fruit delivered to your door. Maybe they will in the future you never know! I love fruit but its doesn't like me so much however I know my mum wishes there was a scheme like this in Yorkshire as she does the slimming world diet & has to eat alot of fruit. Maybe you could pass on the idea to her about maybe joining up with local slimming clubs. Great review - if you can afford these types of boxes, I would defo recommend too! 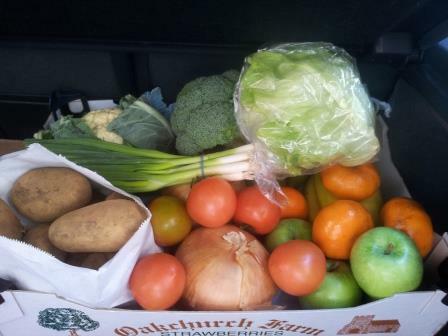 I get a veg box delivered every week from a local organic farmer. Yes, it does cost more but the difference in taste is outstanding!